There are more than 3000 medical device manufacturers in China, most of them established in the 1990s or later. The maturity and product quality levels differ across both companies and product types. These companies primarily cater to the internal market, but more and more are aiming for global expansion and today at least 5 are listed on international stock exchanges. Generally the Chinese medical device manufacturers will start marketing their products in other developing countries in the Middle East and Africa before going to the Western markets. The products are considered to be mid- or low-end with simpler functionality and lower cost. The present report investigates the obstacles for the Chinese medical device manufacturers when trying to access the Western markets. Research is based on interviews and literature review, and a model of the system dynamics for the Chinese medical device manufacturers in the Western markets is presented. The findings are that for the mature companies that have actually mastered the adequate product quality level required by Western regulatory bodies and consumers, the largest obstacle the Chinese medical device manufacturers face in the West is the perception of everything made in China being of poor quality. Reports on poor quality of unrelated products, like food or toys, make the Western consumer skeptical to buying Chinese medical devices. The Chinese manufacturers find this perception difficult to meet directly, and are rather fighting it with trying to produce at higher and higher quality levels and by starting their own product development. They are of the opinion that if they continue to deliver products with high quality the customers will gradually become more accepting of Chinese devices. Another strategy for venturing abroad is through acquisition of Western medical device manufacturers. The current economic downturn represents an opportunity for the Chinese manufacturers as the Western buyers, which are usually the governments, will start looking for cheaper devices than what the Western market leaders have traditionally offered. In conclusion the most mature Chinese medical device manufacturers have good prospects with a growing Chinese market and an increased need for more affordable products in the Western markets. 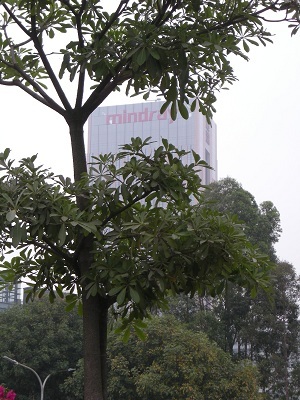 On my way to interviewing Mindray in Shenzhen i took this picture of their building with my cell phone from the taxi. Throughout your thesis, indeed give me good idea for China Medicale Device Manufacture, if you can have more analysis between Global and China that would be good. Very good article. I found it to be very informative. As you mentioned in your thesis, a strategy for Chinese medical device manufactuer to venture abroad is to go through acquisition of Western medical device manufacturers — I guess Mindray is a good example when they acquired part of datascope — so have you seen any trend like this in this case? Your article was most interesting and informative. We are representing non EU companies requiring to register their medical devices in the EU and were wondering if you could recommend a Chinese publication where we could advertise our services ? We already have a number of business relationships in China but find it difficult to tap into the smaller companies who wish to enter the EU device market. Any guidance you can give would be most welcome.